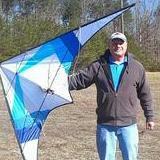 In short, this kite is as responsive as advertised.. The biggest leap forward is the Sync Bridles.. Not conventional, nor is it a turbo or french bridle. It literally makes the whole wing a lot more of a cohesive unit while maintaining the independence of the inputs. For those that fly with a lot of brake (and I do mean a lot) you might have to back off that mindset a knot or two for first flight. The design of the bridles seems to have the the extra brake so many of us desire already incorporated to a point. That being said, control feels familiar but at the same time, almost enhanced in the responsiveness. Bottom line, a true quality product that's a significant step forward, right out of the bag. Everything you would have considered adding before is now already there. Looking forward to more time on the handles with this sail.. Looking to release with a minimum of standard, mid and vented - two more tiers of venting planned as well. That being said - I flew my standard prototype today in up to 13mph with a P100 frame if you can believe that, while the Djinn’s power is still intact, the “runaway” pull and speed is muted by the bridle... Everyone else was on mids and full vents, I expect this characteristic to carry up through the vented models too so it’s quite possible that a Djinn full vent may be as manageable as an xtra vent flown in it’s wind range. We're pleased to yet again announce the next prize being given away to our most appreciated supporters, the Kitelife Subscribers... For roughly 10 cents per day they play a major role in keeping KL growing in every way. Djinn ST from Kite Forge, $375 value, in your choice of standard colors (cool, hot, green or purple fade)! == Full info - https://kiteforge.com/djinn More videos - https://kiteforge.com/videos/ This package includes a ST (standard) sail, Mystic 12 frame and a kite sleeve! NOTE: You will be able to choose any one of the standard color combos, but it will be exactly the same Djinn ST configuration that I fly myself - no special mods needed, it's already a boss right out of the bag... We should be able to ship from existing inventory when a winner is drawn, worst case will be 2-4 weeks for restock (depending on color choice). You can sign up here. Odds of winning for this prize is currently 1/377, and will be drawn on Feb 21st, 2019! Our thanks, and the very best to you... Let the drooling begin! We're pleased to yet again announce the next prize being given away to our most appreciated supporters, the Kitelife Subscribers... For roughly 10 cents per day they play a major role in keeping KL growing in every way. B-Series VTD, roughly a $350 value and no longer manufactured by Revolution as of 2017! This package includes a VENTED sail, 3 and 4 wrap frames, adjustable handles, DVD and kite sleeve! NOTE: Primary color of the kite in this drawing is RED and BLACK on a VENTED SAIL... This is regular (factory) model, it is not a Pro by Bazzer, but will still provide excellent flying for whoever wins this. You can sign up here. Odds of winning for this prize is currently 1/375, and will be drawn on Sep 25th, 2018! Our thanks, and the very best to you... Let the drooling begin! Hopefully this compensates somewhat for the delay with our last drawing. And for the record, it *might* be possible too negotiate the model (ST/MV/VT) if you already have a Djinn ST in your bag. No promises, but you guys know I'm always keen to try and find a happy balance. It’s the #Djinnebago, of course. Going for license plate KYT 4GE. A new 1.5 mesh based on the Challenge PolyMax and a touch of Icarex Light Blue scrap. Hoping to make this a higher wind kite. Made my own 1" strips from the poly this time instead of using tails. I may open the mesh pattern a bit but you get the idea. Playing with some of all I've learned. You can see a touch of Mesh, A touch of Poly, and a hint of Perspective. Except for the snowflake entire sail will be the Midnight Challenge PolyMax. I'll also be edge binding in the same material. LE will be my normal White. Touch of Blue got its leading edge today. We're pleased to yet again announce the next prize being given away to our most appreciated supporters, the Kitelife Subscribers... For roughly 10 cents per day they play a major role in keeping KL growing in every way. The winner of this drawing will receive one brand new Kaiju by Kite Forge, complete with 7' lines ($135 value)... Actual prize kite is white and blue, as shown in the photo and video above. == Info on the Kite Forge website: http://kiteforge.com/product/kaiju/ http://kiteforge.com/help-tutorials/ == If you haven't done so already, You can sign up here. Odds of winning for this prize is currently 1/381, and will be drawn on April 20th, 2019! Our thanks, and the very best to you... Let the drooling begin. Piecework for the center panel is done. Decided on 3 vertical orange panels to define the middle. I tried several pics to get the UV/Flo Yellow effect and got a pretty good capture.. First with the black light only.. Next is normal light Then Both Only this portion of the kite lights up. (unless I decide to use fluorescent thread.) I have not yet checked the white Dacron to see if it will light up well. Would be an interesting LE effect if it does..
A few of us DC Misfits got our hands on a custom Djinn this weekend. Per usual the wind was, well, non existent. And per usual, these guys make it look easy. YER on YER OWN with this one, fella!!! What ever suits your eye best is what works here! Don't even want to know how many hours I've spent on that colorizer .................................................. ...........................................................! We're pleased to yet again announce the next prize being given away to our most appreciated supporters, the Kitelife Subscribers... For roughly 10 cents per day they play a major role in keeping KL growing in every way. B-Series STD, roughly a $350 value and no longer manufactured by Revolution as of 2017! This package includes a STANDARD sail, 2 and 3 wrap frames, adjustable handles, DVD and kite sleeve! NOTE: Primary color of the kite in this drawing is RED and BLACK on a STANDARD SAIL... This is regular (factory) model, it is not a Pro by Bazzer, but will still provide excellent flying for whoever wins this. You can sign up here. Odds of winning for this prize is currently 1/373, and will be drawn on Nov 15th, 2018! Our thanks, and the very best to you... Let the drooling begin! The best part of the Djinn is that you're getting the "PRO" regardless of stock color or custom color. Out of the bag, it's the exact kite JB or Brett have in their bag. I've flown all 3 vents variations and I can say the Djinn didnt make me a better pilot. It let the pilot in me come out better. Hello... it's been a l-o-n-g time since I've gotten out to a festival, or had anything personal to post about. I've been around, still very interested in kiting, just haven't had a chance to get out and really fly much. I actually missed last year's LBI kite fest and that was a real bummer, because the pictures that I saw from friends showed that it was even better than the first two years. Well, LBI kite fest is four years old now, and will hopefully exceed expectations, as long as the weather holds out. I got here in the early afternoon on Friday, and was happy to see that there were all ready kites in the air. So, I went strait to the beach, put out the full vent as the winds were over 20mph, and got a taste of how rusty I am. Most of it came back quickly, but wow, don't take 6 months off and expect to pick up where you left off... Anyway, the indoor event is on the first night of the festival, it's held at a local elementary school. Not a huge gym, but big enough to fit about 200 people on the side-lines and in the bleachers. This is the first time I've flown indoors other than in my living room, so it was, uh, interesting ? I've flown in zero wind conditions plenty, so it wasn't much different that outdoors other than having different obstacles. I was very impressed with the skills of the many competitors, single line, dual line, and quads. 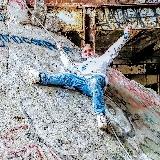 I'll roll some pictures and I would guess that there will be some familiar faces to some of you... In the mouth !?! I know, right ? not only does he fly with a handle in his mouth, but he can fly 2 at the same time... Decas, no less ! The gratuitous Kaiju shot... 😎 So, this guy got me to fly my first demo. First indoor demo. I think he might be a bad influence... a great guy, it was so good to see him. This was an unexpected treat ! Hopefully, I'll remember to get the camera out tomorrow on the beach. I forgot today, but it was kinda nasty windy and rainy, so the camera is better off. I'll keep yous posted. Ok, I remembered to get my camera out today while I was on the beach. The weather could've been better, and the winds were just little high for dual line flying, but that's all I flew, anyway. It was a great day flying OPK's, and some of my own. I met some incredible kite artists, and ended the night with a night fly... The experience of laying in the sand, flying the light kite for and hour was indescribable ! Highly recommended ! WOW! I am really excited. I won the REV 1.5 vented package almost 10 years ago, ( Dec, 2008.) My son and I have really enjoyed it but it will be even better to be able to fly together now. Thanks so much, John, for the great prize. I discovered KiteLife online way back around 1998-99. It was very much instrumental in renewing my interest in kiting. I have been making and flying kites ever since. I have attended numerous kite making retreats, festival in several states and countries. I have taught at several retreats and kiting has been a part of mine and my family's life. I am proud to have been a supporter of KiteLife for all of this time. I am so happy that they inspired me to get back into kiting. Next up is a series of 3 sails all in gray tones (Black, Charcoal, Silver and White)..Not sure if this will be a stack or individual kites yet. Picture is to give an idea of what is coming. Patterns are by no means set yet. Gray 2 is done.. Decided it should be the smaller 72" (B2 size) Ready for flight testing..
Widow NG end of life? Wow. Thanks to everyone for the thoughtful responses. In short, I've gone from "end of life?" to "good as new" in response to this thread. rporonga and several others nailed it right off the bat. Several of the c-clips holding the elbow connectors had come loose. The left upper was an inch low, left lower was 2 inches low and right lower was an inch or so high. I'm embarrassed that I didn't see this myself (it was obvious once primed to look at it). I had checked that the elbow connectors were flush against the c-clips but hadn't measured them for symmetry. I repositioned them to the factory positions, glued the c-clips in place and she looks to be good as new (minus a little Tedlar tape). The slack sail noted by Jon T (thanks Jim for emailing him) and Wayne was also remedied by moving the elbow connectors to the correct place. Thanks again to everyone. What – leaving the kite in the car? Are you out of your mind?! You can never expect a lasting relationship if you make it feel neglected! Quick mock up of what's coming for this purple kite.. No clue on the center yet until I take some measurements after basting.. Hopefully a full basted mock-up and back-lit shot by the weekend. My first buggy ride was with the Symphony 2.2.4..
Yeah, that Barresi guy will fly his kite on your grass. Gotta watch out for him. You never know where he'll pop up next. Next thing you know you'll be flying a kite with him and having a cold one after. Run when you see him. He's the kite pusher man. (insert Steppenwolf tune here) You know I smoked a lot of kites, oh Lord I . . . and you won't believe you're on the eve of destruction. Seriously, though, yup that's the one. And he'll fly with you. It's a whole lot easier than getting a game of horse with Michael Jordan, and asking him to help you with your shooting and dribbling. Get comfy, you're family. 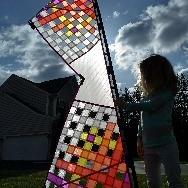 This kite now has a new home. More info very soon..Reinforced a few parts after a consult with @John Barresi and added the Air Force logo to make it a 1.5 version of Yonder.. @Roadwarrior26 Enjoy your new kite and Welcome to Kite Life.. Addict Kite magazines best multi purpose 2 line kite of the year 2018 KAIJU . HOORAY JB!! !